Heart and love tattoos offer so many ways to say "I love you". Who do you want to tell? Love is in the air; love is like oxygen; all you need is love. Recognize any of these lyrics? Love is a mighty popular topic. You might even say love makes the world go round. Alright, enough cheesy lines. Let's get down to business. 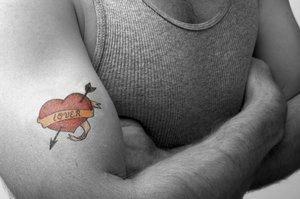 There's certainly no shortage of ways to express your feelings with heart and love tattoos. Just consider the many types of love there are, and you'll quickly understand why. Agape: Also known as unconditional love, this is the love that soldiers on when other types of love give up. Philo: This love is made of tender affection. It can be expressed toward friends, family members and significant others. Storge: This love encompasses simple gestures of affection. Kissing, holding hands and hugging are all signs of storge. Eros: This is the love that expresses and fulfills your physical/sexual desires. These are the simplest forms of love, and when all four are combined the result is perfect love, the kind strong lasting partnerships are made of. However, we all know that purity is hard to maintain. An absence of one type of love sometimes, but not always, triggers an imbalance that leads to things like selfish love and jealous love. Such are the things that many songs and tattoos are made of. 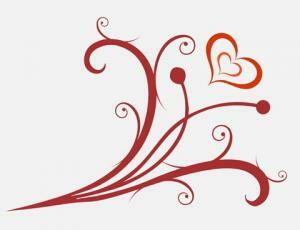 So, what kind of love are you yearning to express with some body art? Red hearts: After all, red is the color of romance. Purple hearts: Purple is the color of passion. Hearts and red roses: Pure romance, baby. Heart pierced by an arrow: This signals you've been thoroughly love struck. Cupids: These can get a little cutesy, but Cupid was the cherubic looking Roman god of love. Eros: This is the Greek version of the god of love. Eros is depicted as a young man with wings. 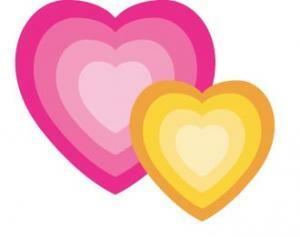 Rainbow heart: This is often used as a symbol for gay love. 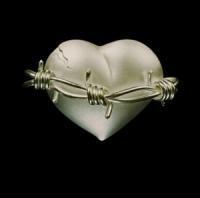 Shattered hearts: Picture a heart criss-crossed by hundreds of tiny shatters. Bleeding hearts: This one is sometimes combined with the broken heart motif. Flag hearts: This incorporates the pattern of your chosen flag within the framework of a basic heart design. Heart and eagle: This is a very American design. I heart...: You fill in the blank. 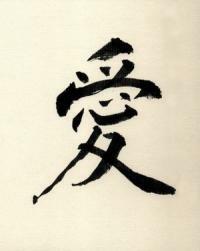 If you haven't discovered Kanji yet, you really should check it out. The symbols are beautiful, and you can use them to express your feelings, but you won't truly be advertising them unless someone actually understands the meaning of the symbol.A word of caution: Make sure you select the correct symbol, and cross check it against other sources. A slight variation between designs can change the entire meaning of your tattoo. Claddaghs blend love, friendship and loyalty. Celtic knot hearts symbolize never-ending love. Do you have a special heart and love tattoo of your own? Use the comment box below to tell us about it.